THRIVE in our ACTIVE AUGUST Challenge! I want you to focus on a word for the next few months... THRIVE! I heard this word in a pod cast this past week and it has really stuck with me and I think it will motivate us to continue to live a healthy lifestyle. With summer coming to an end, and school starting just around the corner, it is time for our August challenge! Our goal in AUGUST is to be ACTIVE EVERYDAY! 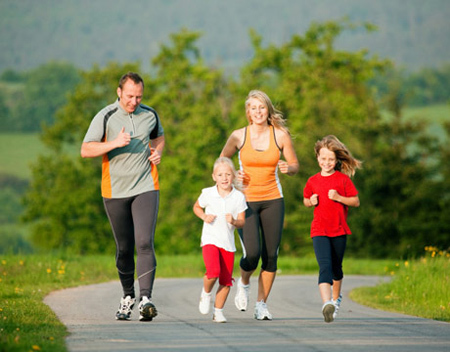 Even if it is a quick jog around the neighborhood, a nice walk with the family, or swimming with the kids, anything counts! Just get up and move for at least 30 minutes each day! Click on the calendar below to download the August challenge to help keep track of your exercises and progress! Fill in each day what you complete and show it to me SEPTEMBER 1ST and one person will win a FREE TRAINING SESSION! Activity can improve your quality of life and can have immediate and long-term health benefits, especially when it is done daily. feel better - with more energy, a better mood, feel more relaxed and sleep better! Daily activity of up to 30 minutes can lead to a healthier state of mind. Prevent weight gain, promotes weight loss (when combined with a lower-calorie diet), and helps keep weight off after weight loss. Having a daily exercise routine can increase motivation to slowly increase your exercise period each day. Starting at 30 minutes is a great place to start! Exercising While Pregnant - Yes!! !